« Day 131 – Manni P.
Day 132 – Mark E.
On Sunday I checked out a new coffee house in Dupont called Filter. It’s well located, tucked behind Connecticut Avenue on the more laid back 20th Street. I descended a few stairs and walked into the cozy, hip coffee joint an ordered an espresso. The prices seemed slightly higher than Starbucks and Cosi, both of which are right around the corner. Overall I liked the place, despite a guy who was working there complaining that a nearby restaurant manager sent about 10 or 15 of her staff over to get espresso so that they understood what a good espresso tasted like. He didn’t like that they got it to go and one person reached for a cup before it was ready, etc. Anyway, when you work in an open atmosphere you need to be cognizant that others can hear your conversation. As a new location, I would have been thrilled to have 15 customers. 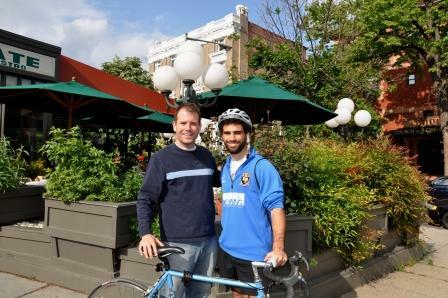 While I was there I met Mark, a graduating senior studying economics at the George Washington University here in DC. He graduates on May 17th and is frantically wrapping up his final papers and studying for his last exams. I remember my last week of college. It was a great feeling to be “finished.” Little did I know that I was only finished with another segment of life and that new challenges and tests were just over the horizon. Mark is from the DC area. He grew up in Montgomery County and graduated from Magruder High School. He and I have something in common related to the $10. Well, in a round about way. So Mark has a plan to go to Prudhoe Bay, Alaska and embark on a bicycling journey all the way to Ushuaia, Argentina. I asked him how far this was and he said, “I don’t know exactly…several thousand miles.” Well, I did a little checking and I calculated that it will be at least 11,000 miles! That is like going across the continental US from ocean to ocean 3.5 times! Along the way he plans to give people $10 and a self-addressed stamped envelope. He will ask that they send him photos, stories, poems, etc. to him as well as a note explaining how they used the money. He sees it as a way to get to know the individuals as well as study the marginal propensity to save (or to consume) in different cultures. Anyway, watch the video and you will learn a little more about Mark’s interest in cycling, his cycling trip around Spain and France as well as his plans for his upcoming trip from Alaska to Argentina. I also included a small piece where he talks about volunteering to help an adult read better. As you might expect, Mark put the $10 toward his savings needed to make the trip. I asked Mark if we could help him with anything on the Lend a Hand page. He said he needs funds to help him make his journey to Argentina. He applied for a grant from the University but was denied. I think there is a way to make this happen with corporate and individual donations. Furthermore, he needs to find a house/apartment in DC for the summer. He is looking for a place in DC that he will share with three other friends with a monthly rent of less than $3,000/month. Mark is also looking for a summer job, possibly in economic development but he is also open to other ideas. He seems like a great guy and would be a good addition to any business. Before we said goodbye, Mark asked if I would consider being on the finish line in Argentina when he gets there. I would love that! We agreed to meet in a couple of weeks and do a bike ride after I get my bike out and get into shape a little. I was so inspired after our conversation, that I went home, got my bike in working order and took it for a short ride that evening. Thanks Mark! “Connection” continues to be a theme that weaves through these encounters. I have a book recommendation for Mark, once he’s done school–The Bicycle Diaries by David Byrne. In addition to being a musician, artist, blogger, etc., Byrne is a noted bicycle rider and in the book (which is based on his online journal entries) he gives his impressions of cycling in many of the major cities of the world. It’s not just about cycling though, he touches on a variety of topics. It’s a really interesting book and you don’t even need to be a rider (or a Talking Heads fan, for that matter) to get something out of it. But based on some of the things Mark says in the video, I think he’d find it very interesting, if he hasn’t already read it. on May 1, 2010 at 7:21 pm | Reply Mark E.
Many thanks for your book recommendation! I have been looking for a new book to enjoy once my finals are finished. I will certainly pick up a copy of The Bicycle Diaries from the library. REEED,YOU ARE AN INSIRATION!! THANKS.GOD BLESS YOU.KEEP UP THE GOOD WORK. hope u are at the finished line so u can keep us posted!!!!! While I was biking solo with camping gear from San Diego to Florence, Oregon and then on to Yorktown, Virginia which involved crossing the Continental Divide seven times, I treated the trip as mostly one day at a time. On some occasions, it became one hill at a time or even one hundred more pedal strokes at a time on a more difficult hill. Eleven hundred miles on a bike is doable with a similar frame of mind, as is any meaningful venture in life. Good luck to Mark. Mark will have a wonderful time and be so blessed by his experience. This is such a fun way to ‘meet’ people and hear what they think they should do with $ and life itself. on May 1, 2010 at 7:24 pm | Reply Mark E.
Thanks for your wishes. I agree that this is the best frame of mind to have. Your trip sounds amazing as well! I hope that you are continuing other cycling adventures?! on May 3, 2010 at 11:49 am | Reply Mike in the "Couve"
Hope you keep everyone posted on your journey, either through here or your own blog. If you’re doing your own thing, make sure to post a link here. Also, not sure if you’re coming down I-5 or the coast, but if you’re more along I-5, let me know when you are passing Vancouver, WA (not Canada, eh? )….I’d love to buy you lunch if it works for you to stop your ride at that time. on May 4, 2010 at 9:31 pm | Reply Mark E.
Many thanks for your wishes. I am still trying to finalize sponsors for the trip, but once I do I will certainly keep you updated with my plans. As for meeting in Vancouver, I may just take you up on that!! on May 12, 2010 at 8:40 am | Reply Laurie M.